Have you met Rilakkuma yet? He’s an adorable teddy bear character who is extremely popular in Japan…and now he is here at Stickers ‘N’ Fun! We are so excited to be able to bring you a brand new range of stickers featuring Rilakkuma and his two friends, Korilakkuma (a light coloured bear) and Kiiroitori (a little yellow bird)! Rilakkuma was created by San-X, a Japanese company that specialises in kawaii stickers, stationery and other character goods. Rilakkuma was first created in 2003 and in 2010, was ranked as the fifth most popular character in Japan. And it’s not hard to see why! He is so cute! 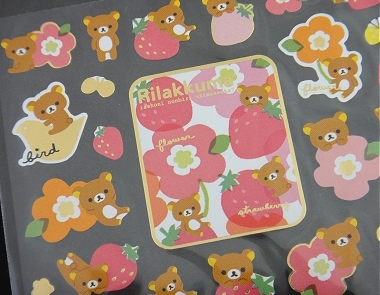 Our new range of Rilakkuma stickers feature a whole range of themes – some designs feature Rilakkuma with strawberries, some feature him with macaroons and other desserts, some with coffee and chocolate…and more. But Rilakkuma and his friends are not the only creations from San-X that we have to share with you. My personal favourite is a collection of characters known as Sentimental Circus. The Sentimental Circus characters are said to be a group of cute, abandoned toys. The main character is Shappo. He is the pink, rabbit-like character who plays the role of the circus ringmaster. The other characters include Mouton (the elephant), Rio (the lion), Kuro (the black cat), Pigu and Mamo (the trapeze artists) and more. Another popular character is Kutusita Nyanko. He is a cute little black cat. He is often called Boots or the white socks cat as he has cute little white paws. Kutusita Nyanko also has a few kitty cat friends. They include a small, white, fluffy cat called Norutti and a grey kitten called Lossy. 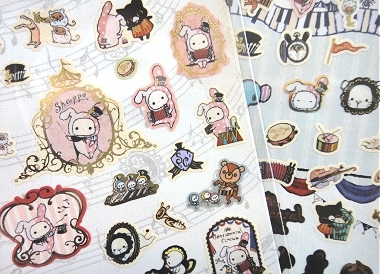 As you can see from the stickers pictured above, they are all just too cute! Of course, there are many more characters to choose from. They include a cute little pink pig named Piggy Girl, a sweet, chocolate loving Panda named Chocopa, friendly dolphins from Sea Paradise, Sweet Face seals and penguins and many more. 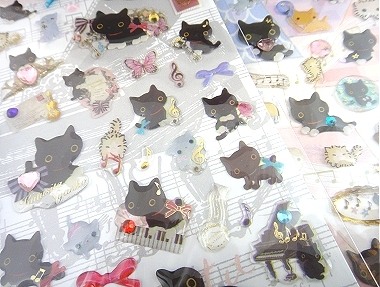 And they are all featured in our new range of kawaii stickers from San-X Japan. We hope you love them all as much as we do. 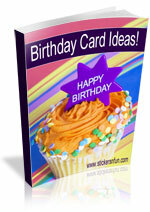 They would all make sweet embellishments for your card making, scrapbooking and paper craft projects. I’d love to hear what you think of our new kawaii stickers. Please leave a comment in the comments box below. This entry was posted on Wednesday, June 5th, 2013 at 3:49 pm	and is filed under Kawaii Stickers. You can follow any responses to this entry through the RSS 2.0 feed. You can leave a response, or trackback from your own site. The stickers are cute. I want to have them. I love them so much… so cute.. It will be nice for my scrapbooks. These are adorable. They are on my wishlist.